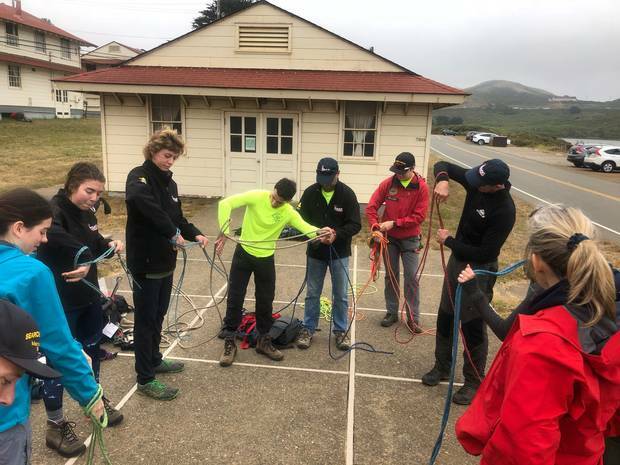 Sophie Wardell, Jack Niles, Laura Degas and Tom Hoffart, aged 15 to 18, are participating in a four-day training exercise with the Marin County Search and Rescue team in Yosemite National Park. The students arrived in San Francisco on Sunday with instructor Neil Penniston, who said they had just arrived at the national park where there were wildfires still burning. Penniston said the Western Bay students had offered their services to help battle the Californian wildfire which had claimed the life of heavy fire equipment operator Braden Varney, 36. California Department of Forestry and Fire Protection officials have said the fire had spread to more than 17,000 acres (6800ha) since the wildfire began on Friday night. The Ferguson fire had seized parts of the Mariposa county area, threatened about 108 homes and businesses and had more than 1800 local and state firefighters deployed to battle the blaze. Penniston said the students had so far learned valuable rope skills with their hosts and were treated to a county dog team demonstration.